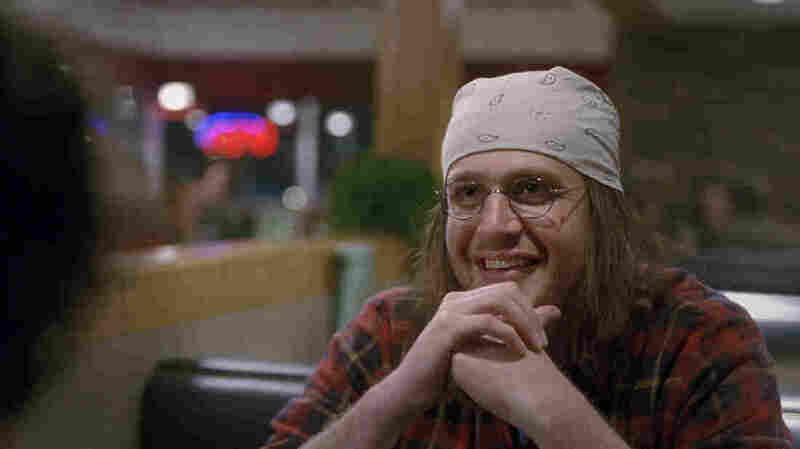 Jason Segel plays writer David Foster Wallace in the new film The End of the Tour. The late David Foster Wallace still casts a long shadow over the literary world almost seven years after his suicide at age 46. Wallace is the subject of a new movie, The End of the Tour, which opens Thursday in New York and Los Angeles. The film depicts Wallace at a big moment in his career: It's 1996, he's just turned 34, and he's on a publicity tour for his breakthrough novel, Infinite Jest. In the midst of all that, Rolling Stone sends a reporter to interview Wallace and the pair spend five days talking and arguing about fame, depression, pop culture and junk food. What I'm really proud of about this movie is that I think it's an extension of the themes that David Foster Wallace was really trying hard to express in his writing. Jason Segel plays Wallace in the film. He says, "What I'm really proud of about this movie is that I think it's an extension of the themes that David Foster Wallace was really trying hard to express in his writing." Wallace was known for dense books that ask a lot of the reader. Infinite Jest runs to more than 1,000 pages, including hundreds of endnotes and sentences that sometimes stretch on for pages. But Wallace was also funny, smart and an incredibly sharp observer of the world around him. David Lipsky, the reporter Rolling Stone sent to interview Wallace, says, "He's not the way you imagine writers. He is someone who is engaging with the exact same world that you are engaging with." Lipsky's Rolling Stone story was never published, but when Wallace died in 2008, Lipsky wrote an essay about him for NPR. Eventually, Lipsky put his interviews together in a book called Although of Course You End Up Becoming Yourself. "I loved his work," Lipsky says. "And he was an electrically charming man to be around. And so I tried as much as possible when writing prose about him to do it in his own words. The way the book works is it starts when I turn the tape machine on — when I walk into his house — and it stops when I went home. It is just what David wanted to talk about." A lot of the dialogue in the film is based on these interviews, and some of it is adapted directly from Lipsky's tapes. Director James Ponsoldt says, "In many ways we were aiming to do something that was an anti-biopic. Because we were just telling a very narrow slice of time — of David Foster Wallace for several days in 1996 — it allowed us to focus on, you know, a narrow window and hopefully go deep during that time." "Part of the book is sort of about a culture of kind of attention and hype and image and stuff. And so there are a number of complicated ironies about this. And I also — I mean, writers are combinations of very shy people and egomaniacs." We are very interested in people reading David Wallace's work, which we feel is the best way to learn about him and to remember him. We are not interested in selling David Wallace the person, because he would have hated that. But according to Alex Kohner, co-trustee (along with Wallace's widow) of the David Foster Wallace Literary Trust, Wallace would not have wanted to be the subject of a movie, and the trust doesn't approve of the film. "This movie wouldn't have been made if David was alive," Kohner says. "We are very interested in people reading David Wallace's work, which we feel is the best way to learn about him and to remember him. We are not interested in selling David Wallace the person, because he would have hated that." But Wallace can't speak for himself, which leaves his trust with limited legal options. Ponsoldt, the director, insists that everyone involved in the movie did it for the right reasons. "This film was made with so much love and empathy for David Foster Wallace's writing, for what it's meant to us," he says. "We made it with very sincere intentions." Lipsky says, "I wanted people to know that he was not just someone who committed suicide, but someone who had written the best stuff of the last 20 years. And I wanted to say, 'Hey, here is what this person was like.' "
And if more people decide to pick up Infinite Jest and Wallace's other books because of this film, Lipsky says, that would be the best homage.